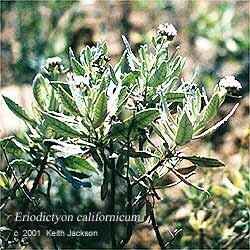 Eriodictyon californicum (Hook. & Arn.) Torr. Yerba santa is a sticky-leafed evergreen native to the southwestern United States. Unlike many other astringent herbs, yerba santa actually has a pleasant taste. It is used as a food flavoring and as an additive to herbal syrups to disguise the taste of other ingredients. It was given its name ("holy weed") by Spanish priests impressed with its properties. Can be used as a tea, but must be allowed to steep for at least half an hour to dissolve the resins. More often used as an alcohol tincture.